Some weeks ago, while showing this blog to Karen Tisdell when it was brand-new, we had a very quick try at working out how to follow it. Although she too has a Google+ account, and I had added a Google+ 'follow' widget to this blog, we couldn't work out how to do it – the problem was that the Google+ page it brought up wanted her to create a Google+ account, not recognising she was signed in to Google+ already. We're still unsure why. But I also think the Google+ follow widget is designed to allow one Google+ user 'follow' another Google+ user: I suspect it doesn't actually follow the blog, it just loosely connects your Google+ account to theirs. So, how to follow? The short answer: click on the button, over on the right (not on the mere image of the button, here!). 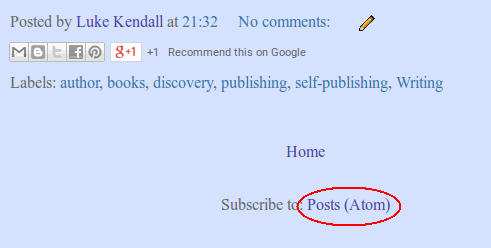 Short answer #2: I think you can also use the “Follow by Email” widget to get emailed when I create new posts. Note: The rest of this article is as much about how to add widgets to a Blogger blog, as it is about how to follow this one. I think it just barely fits into the topic area I'm trying to cover in this blog. Anyway, after some investigation, I think I've worked it out. (I googled: blogger how to follow). As the blog creator you can add widgets to your blog by signing in to Blogger and navigating to the dashboard (which you as the owner get to by clicking on the “Design” link at the very top, over on the right). You then simply click on the Layout link for the blog (which is over on the left), and after that, over on the right, you click on an “Add a Gadget” widget in whichever position you want the gadget to be placed (see the diagram above). Any of those Add a Gadget buttons open a fresh tab in your browser, showing a page that provides some pre-authored sets of widgets. There's a tab holding the “Basics” set and a tab with “More Gadgets”. I hadn't noticed the 2nd tab, but this time I clicked through to it, and took a punt that the “Followers” gadget was the same as the “Join this site” widget that the Blogger Help page revealed by the Google search I'd done earlier. The result looks promising, anyway. I'll see how it goes and edit this post if I learn of any problems. If (like me) you're not very familiar with “RSS feeds,” I think they're basically a way of giving you the kind of horizontally-scrolling news bites you see at the bottom of some TV news programs. You can configure your browser to show whatever RSS news feeds you've subscribed to. The Blogger “Posts (Atom)” RSS link makes it easy to subscribe to such a feed. When you click on that link, you'll be offered a choice of following by either using “Live Bookmarks” or by more traditional RSS methods (like using the InfoRSS browser extension). The Live Bookmarks is an icon on Firefox that you just click on to get a long drop-down list of the various news bites. I tried installing the InfoRSS extension to Firefox version 38, but it was pretty disastrous: it didn't work and it also removed the address bar, the Home icon and other toolbars, and even disabled the Customize page! I installed SimpleRSS instead, and just chose “Live Bookmarks”, and that worked fine. I think this topic is another one for which I have more to learn. So if anyone faces any problems, please let me know and I'll investigate. Either way, I'll update this post as required.